The Elder Scrolls: Arena (also known as The Elder Scrolls Chapter One: Arena in some companion pieces) is the first game in the Elder Scrolls series. Emperor Uriel Septim VII is betrayed by Imperial Battlemage Jagar Tharn and imprisoned in another realm. You alone are left to travel the vast continent of Tamriel in search of the legendary Staff of Chaos that will allow you to rescue the true Emperor and restore peace to the Empire. 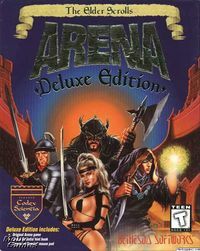 Although it was the first of the series and received very little initial attention, Arena became a cult classic that spread in popularity through word-of-mouth, and it secured Bethesda's place in the RPG industry. 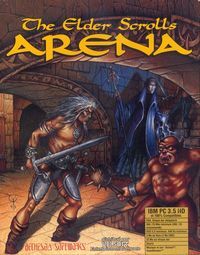 Arena is available for free from GOG.com if you buy another game in the series. Other options for downloading the game can be found here. This page was last modified on 4 January 2019, at 05:47.